Hexi painting (和玺彩画) was historically documented as the most sophisticated decorative art representing the highest levels of technological knowledge and skills for decorating the Chinese Qing (1644–1911 AD) imperial architecture. However, the technological complexity of Hexi painting has barely been scientifically investigated. This article presents a technical case study that aimed to promote a better understanding of (inorganic) materials used in, and the painting/decorating procedure of, Hexi painting. 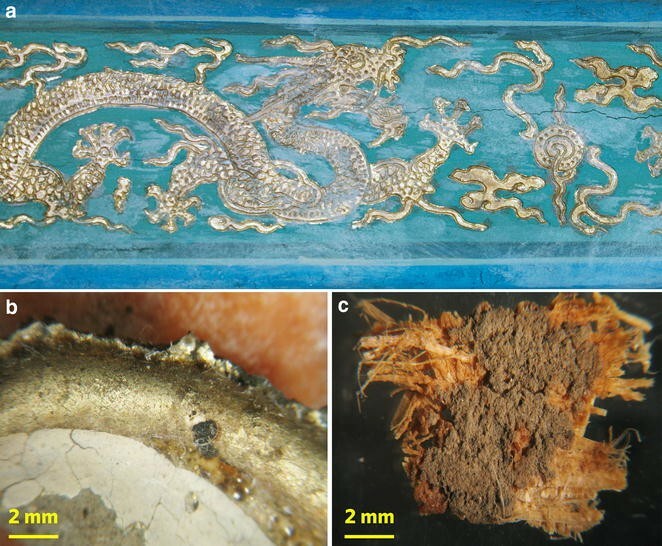 Microscopic examination, compositional analysis, and phase/fiber identification were applied on fragments of golden-dragon Hexi painting (金龙和玺彩画), the most prestigious form of Hexi painting, which were sampled from Xitian Fanjing (西天梵境) in Beihai Park (Beijing, China). The results suggest that neither the kinds of used (inorganic) materials nor the painting/decorating process is exclusively restricted to Hexi painting and distinguishes it from other contemporaneous decorative forms. It is the combination of material use and the painting/decorating procedure that seems to make Hexi painting special. Further studies are needed to investigate the use of organic materials in Hexi painting to expand our current understanding. Characterizing and identifying materials (fiber, pigment and dye) used in Hexi painting by the combined application of SEM-EDX, Raman, and XRD. Hexi painting (和玺彩画) refers to a specific kind of polychromed paintings (known as caihua 彩画 in Chinese) decorated on the exterior or interior surface of Chinese Qing (1644–1911 AD) imperial wooden architecture (such as palace and temples for residence and religious use by the royal families). Textual analysis points out that Hexi, a historically recorded term, refers to a highly organized and specialized painting and decorative technique that incorporates all the best-known technical skills (carving, coloring, embossing, etc.) into one single decorative form and results in highly precious painting and decoration . If this interpretation is sound through time and across regions, it instantly makes Hexi painting the most representative architectural decorative art throughout the 270-year-long Qing history. A series of content and textual analyses on Hexi painting has been carried out since the 1980s, regarding its history and development in different stages of the Qing Dynasty [1–3], technical features and possible application procedures , patterns/decorations and their stylistic and aesthetic implications [2, 3, 5, 6], and so forth, which greatly advances our understanding of Hexi painting as a combination of the highest levels of technical knowledge and skills and the most popular religio-aesthetic needs of the Qing royal families. Two other useful sources of information contribute to the understanding of Hexi painting as well: observations on painting and decoration practiced by present-day Chinese craftsmen in imitation of ancient architectural decorative art (Hexi painting in particular) on modern pseudo-classical architecture or in architecture conservation projects; and analytical studies on materials used in the preparation of and on Hexi painting. Of the above three, textual analysis has often encountered doubts and uncertainties regarding interpretation of historical terms and records, while crafting skills/techniques are always modifying and changing over time and place and often result in unpredictable changes in technological details. In this respect, analytical studies become a more reliable source of information in that they can confirm and complement the other two approaches by revealing the actual use of materials and the way they were used. Unfortunately, published analytical studies on Hexi painting have been very rare. Unlike many other painting forms in the Qing and previous periods, Hexi painting demonstrates a greater technological complexity as it combines carving, coloring, embossing, and other techniques and involves the use of a wide range of materials. More importantly, its technological features were developed to serve the religio-aesthetic needs of a particular group of people with power, authority, and wealth, and therefore must be very carefully selected and developed. Given these observations and thoughts, comprehensive technical investigations into representative Hexi painting samples are required to help us understand: how exactly, from a technological and analytical perspective, did the Qing craftsmen apply Hexi painting to imperial architectural decoration, using what materials and following which application procedure? Results from such studies would not only bring new insights into the techniques that produced Hexi painting, but also have broader impact by allowing comparison between Hexi painting and other contemporaneous painting and decorative techniques, which advances our understanding of how technological choices were made to meet motivations of politics, religion, and aesthetic psychology in the Qing period. Technical studies on Hexi painting have more practical impact as well: it has direct influence on decision-making and conservation strategies for preserving and restoring the Qing wooden buildings upon which Hexi painting is decorated. In this paper, we present a technical case study on Hexi painting fragments sampled from Xitian Fanjing (Western Paradise, 西天梵境), a Buddhist temple in Beijing, China. It aims to reveal, from a crafting perspective, how Hexi painting was prepared and applied to imperial temples. Cross-sectional examination of recognizable fiber, pigment/dye, and paint layers between the innermost and the outmost suggests the complexity of painting/decoration process and the elaborateness of preparation for Hexi painting. The subsequent layer-by-layer fiber/phase identification and compositional analysis add additional technological details. Finally, technical studies lead us to understand the technological features that make Hexi painting special. Xitian Fanjing (Western Paradise, 西天梵境) is a Buddhist temple situated in the northwestern corner of the Beihai (North Lake, 北海) Park in Beijing. It was built in the Wanli (万历) period (1573–1620 AD) of the Ming Dynasty, known as Daxitian (Great Western Skies, 大西天) and used as a place for Buddhist scriptures to be translated and printed for the Ming royal families. In the year of 1759 AD, the Qianlong (乾隆) period of the Qing Dynasty, it was remodeled, rebuilt, and renamed as Xitian Fanjing. The last documented renovation of Xitian Fanjing occurred in 1775 AD. Therefore, Hexi painting on Xitian Fanjing is 240 years old (from 1775 AD till now) at least. The Hexi painting fragments investigated in this study were collected from Tianwang Dian (Hall of the Heavenly Kings, 天王殿), the main entrance to Xitian Fanjing. They were sampled from Hexi painting decorated on the horizontally aligned wooden beams underneath the outside eaves of Tianwang Dian. Hexi painting on these beams depicts vividly raised walking dragon pattern, in golden/white color and surrounded by cloud pattern, decorated against a dark emerald green and sky blue background. These painting and decoration patterns are recognized as golden-dragon Hexi painting (金龙和玺彩画, see Fig. 1a), the most prestigious form of Hexi painting. The golden-dragon Hexi painting fragments, despite their small sizes, are large and thick enough to demonstrate cross-sectionally the ground layer (including a fiber layer and coat layers), paint layers continuously overlapping each other upon the ground one, and the final decoration on the outermost surface. Figure 1b shows the outermost surface of one golden-dragon Hexi painting fragment, and Fig. 1c is another fragment that retains residues of the ground coat layer, with a fiber layer underneath. A few smaller golden-dragon Hexi painting fragments, although not shown here, have two additional colors painted on their surfaces: black and dark red. All samples for analysis were kindly provided by the Beijing Municipal Institute of Culture Relics and Archaeology. A Nikon SMZ1500 stereoscopic microscopy was used to assist the observation and examination of layers on cross sections of golden-dragon Hexi painting fragments. Selected fragments were polished by hand on water-proof sandpapers until a smooth surface was produced for better layer-structure examination. The cross-sectional observations offered insights about the decoration and painting procedure. The identifiable layers lay the basis for subsequent analytical studies carried out to explore technological details. A FEI Quanta 400 environmental scanning electron microscope (ESEM, Philips, The Netherlands) was used to help identify fibers noticed underneath the ground coat layer by offering super high-resolution images of fine features on fibers’ longitude and cross-section views. Equipped with an Inca 300 energy dispersive x-ray spectrometer (EDX, Oxford, UK), the ESEM was operated at 30.0 kV and 60 μA, with a vacuum chamber pressure of 0.4–0.5 mb. In addition to the SEM identification of fibers, EDX was utilized to determine the kinds of pigment(s) and chemical composition of the golden color. An MXP18AHF x-ray diffractometer (MAC Science, Tokyo, Japan), equipped with a Cu x-ray tube, was utilized to characterize inorganic substance(s) in the ground coat layer and pigment that produces the dark emerald green background on Hexi painting by determining their crystalline phase(s). The x-ray diffraction (XRD) unit was operated at 40 kV and 100 mA, with diffraction angle ranging from 10° to 70°. XRD patterns for reference materials (quartz, anorthite, atacamite) were cited from the International Center for Diffraction Data (ICDD) PDF cards (PDFs: 79–1906, 76–0948, and 71–2027). The multilaser confocal Renishaw InVia Reflex Raman spectrometer (Gloucestershire, UK) was used to identify pigments and dyes that produce different colors on golden-dragon Hexi painting. Two excitations (514.5 and 785 nm) were tried to obtain the best Raman signals for each color (white, dark emerald-green, sky blue, dark red, and black). Raman spectra were recorded in wavenumber between 100 and 3000 cm−1, with spectral accuracy of about 1 cm−1. An optical microscope was used to focus the laser on samples, at ×50, throughout the analysis. Calibration is carried out on the Raman spectrometer on a daily basis using the Raman signal of silicon at 520 cm−1. Background spectra of water and carbon dioxide are obtained in ambient air. Raman spectra presented here were smoothed without baseline correction. As suggested earlier, our observations reveal multiple layers on cross section of each golden-dragon Hexi painting fragment. The general sequence and combination of layers remains the same for all investigated fragments, although minor differences are indeed noticed. Figure 2a unveils a typical sequence of coat and paint layers on golden-dragon Hexi painting: (1) the ground coat layer, applied upon the fiber layer and identifiable as the first coat layer; (2) a blue paint layer, applied right on the top of the ground coat layer to serve as the sky blue background against which the golden dragon and cloud patterns are embossed; (3) a thick white paint layer that immediately follows the blue paint layer, which consists of dense, white substances that helped shape and emboss the dragon and cloud patterns; and (4) a thin gold-colored layer on the outermost surface of Hexi painting. Figure 2b, on the other hand, suggests that some parts of the golden-dragon Hexi painting have an additional white paint layer, labelled as (5), on top of the gold-colored one. Given the fragment structure shown in Fig. 1c, it is realized that both fragments shown in Fig. 2a, b have a missing ground fiber layer that serves as the very bottom layer. Therefore, the major layer structure of golden-dragon Hexi painting upon the wooden surface can be illustrated in Fig. 2c (layers not to scale). Further studies applied fiber/phase identification and compositional analysis to reveal the use of fiber, pigment and dye, and other materials in each layer of golden-dragon Hexi painting. Results from these analytical studies are presented following the layer structure illustrated in Fig. 2c. Discussions are organized to tentatively explain how layers were prepared in the way they were. The ancient Chinese architectural paintings in North China almost always have a ground layer as the very bottom layer. (By contrast, those in South China sometimes do not have a ground layer ). The preparation of a ground layer in architectural paintings clearly originates from ancient Chinese wall painting manufacturing techniques. It was done for several purposes, including (but not necessarily limited to): to produce a smooth surface upon which paint layers can be easily applied; to serve as a support for paint layers and prevent them from cracking; and to allow absorption of liquids (such as oil and water) from the paint layers and therefore produce better visual effects in paintings . The preparation of a ground layer for architectural paintings, just as done for wall paintings, usually cannot be accomplished all at once. It involves several rounds of repeating steps (using the same or different materials) and results in tightly overlapped layers. Due to the difference (or similarity) in materials (such as fibers and coating pigments) used in each round of coating, the ground layer can (or cannot) be further divided into sublayers. Sometimes, even different parts of the same ground layer differ in the number of subdivisible layers. Our observations on cross sections of golden dragon Hexi painting fragments suggest that Hexi painting has a ground layer that makes a distinction between two layers with completely different base materials: a fiber (organic) layer and a coat (inorganic) layer upon it, the latter of which often is further divisible. The fiber layer is applied between the surface of wooden architecture and the ground coat layer. Very often, this layer is missing from cross sections because of its loose texture and easy removable nature in the sampling or polishing process. To characterize the type(s) of fibers in this layer, a small quantity of fibers was carefully extracted from golden dragon Hexi painting fragment shown in Fig. 1c. Rinsed repeatedly with ethanol and dried naturally, the fiber specimens were mounted on a SEM stub for observation, and their SEM images are shown in Fig. 3. Figure 3a shows typical fibrous bundles and fibers, on which one can notice well-pronounced cross striations at frequent intervals to form nodes (as indicated by yellow arrows), which are characteristic of bast fibers most often used in ancient China (such as hemp, ramie, mulberry, and paper mulberry). Longitudinal striations can be noticed on fibers as well . In addition, a flat and somewhat wide lumen is clearly seen on a cross-section view in Fig. 3b, which is quite typical of ramie fibers . To conclude, ramie (Boehmeria nivea, native to eastern Asia and usually known as China grass) seems very likely the source of fibers in the ground fiber layer on golden dragon Hexi painting. In Fig. 2a, the ground coat layer shows a brownish color and have large quantities of particles loosely filled in between. It is about 0.8–0.9 mm thick (in its present form) and has a flat bottom surface, as evidenced by the straight and clear-cut line on the right end of cross-section. Therefore, a smooth surface must have been produced upon the ground fiber layer by some polishing work. By contrast, the ground coat layer shown in Fig. 2b, with a thickness of 1 mm or so, shows at least two subdivisible layers: one with light grey color while the other, on top of the former, with brownish color. The color and texture of substances noticeable in the ground coat layer suggest their inorganic nature, and the contrast in color quite likely indicates the use of different materials in each layer. XRD patterns shown in Fig. 4 suggest that quartz (SiO2) and anorthite [Ca(Al2Si2O8)] be the primary (if not the only two) crystalline phases in the ground coat layer of golden-dragon Hexi painting fragments, regardless which color it shows (grey or brownish). The XRD result clearly excludes the use of chalk (CaCO3), a traditional and widely reported coating pigment in ancient Chinese architectural painting, in the ground coat layer . Rather, it agrees well with crystalline phases noticed in fired clays, therefore suggesting a possible use of powder of fired clays as coating pigment [11, 12]. The practice of using brick powder as a coating pigment has been very often witnessed in architectural painting and decoration (especially on modern pseudo-classical architecture) . Given the finding here, it could be argued that such practice might be traced back 240 years at least. Blue and green are two colors most often noticed and extensively applied on Hexi painting, and they usually occur as the background color against which dragon, grass, cloud, and other patterns are embossed. The investigated golden-dragon Hexi painting fragments unanimously reveal a blue paint layer right on the top of the ground coat layer. It is a thin layer with a thickness of 20–30 μm. Different trial experiments (by means of EDX and XRD) were carried out on the blue color to reveal its elemental or mineralogical composition; unfortunately, none produced meaningful results to explain the blue color. It is the Raman spectroscopy that answers the question. As shown in Fig. 5a, there are a few Raman peaks easily noticeable at 250, 544, 600, 676, 1016, 1231, 1316, 1372, and 1577 cm−1, which correspond perfectly to reported characteristic Raman peaks of indigo (C16H10N2O2) , an organic dye. The strong Raman peak at 1577 cm−1 is caused by C=C stretching vibration characteristic to indigo-blue dyes . The blue color on Hexi painting therefore results, not from inorganic pigments, but from organic dye. Indigo has a long history of use as natural dye in China. Historical records suggest that as early as in the Western Zhou period (1046–771 BC), indigo was extracted from the leaves of Liaolan 蓼蓝 (also known as Lancao 蓝草 or blue grass, Polygonum tinctorium) and used as fabric dye. The earliest analytically proved use of indigo as natural dye so far, on the other hand, is noticed on fabrics dated to the Han period (202 BC–220 AD) . Application of indigo to other base materials such as wood or paper was reported for much later periods (e.g., 680–880 AD , or the early 11th to early 14th century AD ). Architectural painting and decoration apparently required a much larger quantity of indigo and it seemed to occur quite late (mostly documented or scientifically reported for the Qing period [19–22]). This must have benefited from technological advance in the extraction of indigo from plants and the increasing family indigo workshops since the 16th century AD . Textual studies often referred to well-known inorganic pigments (such as azurite or ultramarine blue) as the blue pigment on Hexi painting , and barely considered the possibility of organic ones. The present study, for the first time, confirms the use of indigo on Hexi painting. Given the fact that modern synthetic indigo was first made in the West and did not become commercially available and affordable until the late 1890s [24, 25], more than 100 years after the last renovation of Xitian Fanjing (in 1775 AD), we are confident that indigo on Hexi painting was natural and prepared from native Chinese plants. A white paint layer, 0.1–0.2 mm thick, is noticed right on the top of the thin blue layer. It is composed of whitish materials that created the embossed dragon and cloud patterns on golden-dragon Hexi painting. Therefore, the shape and embossed height of patterns determines the white paint layer’s thickness. Raman spectrum of the white color, as shown in Fig. 5b, demonstrates three instantly noticeable Raman peaks at 284, 717, and 1091 cm−1, all of which have been confirmed as characteristic of calcium carbonate (CaCO3) . The source of calcium carbonate can be attributable to chalk, a very finely grained limestone deposit. Chalk has been used to paint white for quite a good long time (from Neolithic to modern China), and its application on Neolithic dwellings as well as on modern architecture have been widely reported within and beyond China. In traditional Chinese architecture painting and decoration, chalk is often referred to as baitu (literally translated as white clay, 白土) and used for the preparation of the ground coat layer or for decoration purpose . Textual researches and analytical studies that aim to reconstruct architectural painting and decoration techniques in the Qing period have confirmed that chalk was usually not used alone, but mixed with China wood oil (桐油, a drying oil extracted from seeds of tung tree, Vernicia fordii) or sometimes with plant or animal glue instead. Such a practice is the core of lifen tiejin (沥粉贴金, embossed patterning and gilding), a technique during which chalk and drying oils are mixed in a certain ratio and filled into a container (such as pig’s bladder), and then squeezed out for embossing through a small opening [27, 28]. When wet and mixed with China wood oil, chalk is turned into soft paste that can be easily (re)shaped and (re)coated, which is very important for creating embossed patterns (such as the dragon and cloud patterns on golden-dragon Hexi painting). Therefore, while organic materials such as China wood oil awaits confirmation in future studies, the identification of chalk in the white paint layer suggests that lifen tiejin might have been used for embossing the dragon and cloud patterns on Hexi painting. The gold-colored layer, less than 10 μm thick, fully covers the embossed dragon and cloud patterns on golden-dragon Hexi painting. Compositional analysis was carried out at multiple spots on the gold-colored layer by EDX. The results suggested the coexistence of high levels of gold (Au) and silver (Ag) in the golden color (see Fig. 6a), with the relative weight ratio of gold and silver between 3.0 and 3.5. Copper (Cu) is never reported and therefore not a contributory alloying element to the golden color. The elemental composition suggests the use of gold-silver alloy which might have been prepared in weight at a ratio of 3:1. This excludes the possibility that kujin (库金), an alloy with 98% gold and rated as of the best quality for architectural painting and decoration in the Qing period, was used on Hexi painting. It seems more likely that chijin (赤金), a gold-silver (76Au:24Ag, wt%) alloy with the second best quality, served the decorative purpose on Hexi painting . Once elemental composition of the golden color is determined, the manufacturing of the gold-silver alloy as well as their application onto Hexi painting become an interesting topic. It has been well recognized that gold-based alloys were normally applied to the Qing (and onwards) architectural painting and decoration through two ways: hammered foils; powder of hammered foils. Whichever method is used, a binding medium was often needed to glue the foils or powder to base materials such as wood and plaster . SEM image shows that the gold-silver layer is cracked into fragments of irregular shapes and varying sizes (Fig. 6b) on its surface; and image in Fig. 6c suggests a film-like structure, with a much unsmoothed surface and densely packed particles on it, upon the chalk-white paint layer. We tentatively suggest that gold-silver foils were applied on Hexi painting to create the gold-colored layer. The aforementioned discussions have summarized the most important findings we have made on golden-dragon Hexi painting through the layer-by-layer observation and analysis. A few other things are worth mentioning as well. First of all, as shown in Figs. 1b and 2b, a white pigmented layer is noticed partially on surfaces of the dragon and cloud patterns. EDX analysis (Fig. 7a) reports relatively high level of lead (47.4%, wt%) in the white color. Raman analysis (Fig. 8a) shows a strong Raman peak at 1050 cm−1, which is a characteristic Raman band of lead white [or basic lead carbonate, 2PbCO3·Pb(OH)2], a commonly used white pigment in Chine since ancient times [31, 32]. Lead white was not applied anywhere on Hexi painting; rather, it was partially painted on the dragon and cloud patterns and almost always close to the corner of curved surfaces. We believe that lead white was so painted to improve the overall visual effects of Hexi painting by increasing the brightness and shine. Secondly, as shown in Fig. 8b, c, the black boarder lines turned out to be painted by carbon black (amorphous carbon), and the dark red color, another important color quite commonly noticed on Hexi painting, is prepared by hematite (α-Fe2O3). Both were identified by Raman spectroscopy, as evidenced by Raman peaks characteristics of carbon black at 1322 and 1605 cm−1 and those of hematite at 223, 291, 410, 498, 614 cm−1 . Lastly, it is clear that the dark emerald green color (see Fig. 1a) sometimes is also decorated as background against the embossed dragon, grass, and cloud patterns. The green color, according to EDX analysis (Fig. 7b), is rich in copper (39.5%, wt%) and chlorine (14.1%, wt%). Further phase identification by XRD analysis (Fig. 9) suggested the presence of atacamite [Cu2(OH)3Cl] (and nothing else) in the green color. Thus, the green pigment should have been prepared from quite pure atacamite, a popular copper green pigment in the Qing period . The cross section of investigated golden-dragon Hexi painting fragments always shows an indigo-blue layer, but never an atacamite-green one. This suggests that atacamite as the green pigment was applied only after the dragon and cloud patterns were embossed and decorated. Preparation of the ground layer (including a fiber layer and coat layers). Surfaces of the wooden materials are fully leveled and polished to produce a smooth surface. A layer of ramie fibers, probably mixed or covered with wet paste prepared from brick powder, is then applied. The ground coat layer uses brick powder as the main (if not the only) coating pigment, and it is prepared by several rounds of coating. Chinese wood oil or other organic materials might be used to mix with fibers and/or brick powder. Preparation of the background layer. The indigo-blue and atacamite-green serve as two major background colors on Hexi painting. A usual practice is to apply indigo to paint the blue layer, and then atacamite to paint a green layer upon the blue one wherever necessary. Based on our visual inspection of Hexi painting on Xitian Fanjing, we believe that an inverse order, although not noticed in our samples, could also be true (i.e., painting the atacamite-green layer as the main background first and then overlapping it by indigo-blue layer). Preparation of the embossed dragon and cloud patterns. These patterns are embossed by squeezing and shaping soft, wet chalk-white paste out of a container’s opening, following the lifen tiejin technique. The fine particles of chalk must have been mixed and diluted with water and/or oily materials. Preparation of the gold-colored layer. The application of hand-hammered gold-silver (quite possibly 76 Au:24Ag, wt%) foils makes sure that the dragon and cloud patterns look prestigious with a yellow gold color, a color highly valued and reserved only for the Qing emperor and his association. Plant or animal glues should be used to glue the foils onto the patterns. Application of lead white and other pigments on Hexi painting, the last few steps for painting and decoration. Lead white is applied on the corner of curved surfaces of the dragon and cloud patterns to make sure that a bright white color can always be noticed. Carbon black is used to draw black boarder lines, and hematite to paint the red color. Clearly, the preparation of Hexi painting follows a few standardized steps (surface leveling, the preparation of ground layer, coloring, embossing, etc. ), which have been especially widely noticed on architecture from the Ming and Qing periods onward in many parts of China [e.g., 11, 13, 34, 35], therefore revealing no uniquely special treatment in the painting and decorating procedure. Regarding the use of materials in Hexi painting, a few findings attract our attention, which include: (1) using ramie fibers, rather than wheat/rice straw or cotton fibers [34, 35], for preparing the ground fiber layer; (2) using brick powder, in contrast to chalk or unfired loess [34, 35], for coating the ground layer; (3) using chalk, rather than talcum powder and others , for creating embossed patterns; (4) using indigo, rather than inorganic blue pigments [20, 34, 36], to dye blue; and (5) using substantial gold-silver (chijin) foils to decorate the outermost surface of dragon and cloud patterns. However, it is soon realized, upon further consideration, that none of these ‘features’ was exclusively restricted to Hexi painting. That is to say, ramie fibers and pigments used on Hexi painting (such as brick powder, chalk, lead white, atacamite, hematite, and carbon black) can also be noticed on other forms (folk art, for example) of Qing architectural decoration [e.g., 13, 34–36], although they rarely are incorporated into one single package as the case with Hexi painting. Indigo, indeed, is barely reported as blue color on the Qing imperial architecture, but case studies do exist [19, 20]. The extensive use of chijin on golden-dragon Hexi painting is remarkable and undoubtedly a distinctive feature of Hexi painting, considering the substantial amount of gold-silver foils needed. But we do not know whether or not this assumption still holds true when more samples (from other Qing imperial and non-imperial architectural paintings) are included and analyzed for comparison. Given all findings made so far, we propose that neither the kinds of (inorganic) materials nor the painting and decorating process makes Hexi painting uniquely distinguishable from many (if not all) other Qing imperial or folk architectural paintings and decorations. Instead, it is the combination of material use and the painting/decorating process that seems to make Hexi painting special. Considering this possibility, the interpretation that Hexi is a decorative art that “incorporates all the best-known technical skills” seems to make some sense, even though more analytical studies are needed to test whether each feature really is technologically “the best” compared to other contemporaneous techniques and methods of the same kind. Analytical studies on golden-dragon Hexi painting fragments, which were sampled from Xitian Fanjing in Beihai Park in Beijing, China, made a few things clear(er) to us about Hexi painting: (1) there is a ground layer which consists of a ramie fiber layer at the very bottom and probably multiple coat layers (using fired brick powder as coating pigment) upon it; (2) both inorganic pigments (atacamite; lead white; hematite; carbon black) and organic dye (indigo) were used for coloring; (3) chalk was the material that created embossed dragon and cloud patterns; and (4) gold-silver foils was used to paint the outer surfaces of dragon and cloud patterns in a golden color. Considering that our study focused almost entirely on inorganic materials, further studies are needed to confirm the use of organic materials (oily materials, plant or animal glues, etc.) in the preparation of Hexi painting. NL provided the samples to be investigated in this study; JC, TZ, and HH carried out SEM-EDX, XRF, and Raman analyses, respectively; QF and SZ conducted a microscopic examination of the samples; TL and TZ interpreted the analytical results and drafted the manuscript. All authors read and approved the final manuscript. This research was financially supported by the National Natural Science Foundation of China (Grant No. : 41103013). The authors would like to express gratitude to Mr. Yi Xu (University of Electronic Science and Technology of China, Chengdu, China) for his assistance with literature search. Ms. Jiali Wan (Sun Yat-sen University, Guangzhou, China) and Mr. Biao Cui (Zhejiang Provincial Institute of Cultural Relics and Archaeology, Hangzhou, China) also provided useful references.